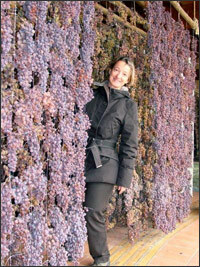 Laura Cesari is an outstanding food, wine and history guide and tour manager in the Veneto region of Italy. Together she and I created and ran a cooking and wine tour in the Valpolicella wine hills, Lake Garda, Verona and the rice plains for five of my ecstatic Canadian and American food and wine lover clients from October 13-19, 2012. Born in Verona, she grew up there and in the Valpolicella wine country so knows the region like the inside of her pocket. When we were creating the tour, I told her the kind of people and experiences my clients enjoy. She quickly understood and took me to see the right people and places. Our itinerary fell into place easily. As a tour guide for many years, she has a vast knowledge of local history, culture and life which especially fascinated our history buffs. She skillfully directed our driver to take shortcuts so our group experienced the most scenic wine roads. In Verona she knows all the wine bars/osterias and chose a non touristed one with great food and local atmosphere for us. When the weather changed, she was flexible and quickly came up with other enjoyable experiences. Her family owns Brigaldara winery and soon she'll qualify as a sommelier so she has a wealth of wine knowledge which delighted our wine lovers. She told me, "I was born to be a tour guide. I love showing people my region." She sure does! She went beyond the call of duty many times to give the group the best experiences and personal service. She's enthusiastic, passionate about her work, fun, friendly and just a lovely person all round. I just wanted to write you a "Thank You" note to let you know that the Schaffners had an absolutely wonderful time with you. They were delighted with your services and just couldn't say enough good things about you. From the bottom of my heart I send you my most sincere thanks for all of your efforts! I know this was a very last minute booking but your arrangements were wonderful and I am grateful to your for your help. I hope that we can work together many more times in the future. Tour Company owner of Endless Beginnings Tour from U.S.A.
Vorrei ringraziarti di nuovo per la bellissima escursione di ieri. Tutti sono rimasti molto contenti e tanti mi hanno detto oggi che eri una guida bravissima e che eri simpaticissima. La degustazione da Tommasi era una bellissima esperienza e anche Lisa molto simpatica. Complimenti 'for a job well done'. I just wanted to thank you for the tour last week. You not only taught us so much, but you opened up a wonderful personal side of Valpolicella and Verona that we will remember forever. Even though my kids were tired, they still raved about the tour. Have a wonderful rest of your summer and I look forward to looking for your wines in the States. I hope you receive this photo through you "tours" email address. We had a lovely day with you and Gabriella. I will send a couple more photos for you to enjoy. Hello Laura and again thank you for today, we really enjoyed the day.Allegrini was an interesting experience, Michelangelo managed to arrange a tour in Allegrinis cellar and it was interesting due to the size of the cellar, otherwise it was interesting to taste the recent vintages of La Poja and Allegrinis Amarone, but I must say that it was much more interesting and fun to visit both your and Marcos wineries, it gets more personal. We really enjoyed our trip and we will recomend your services to our friends. We are waiting for our flight to New York so I thought I would send you a quick note. We thoroughly enjoyed our time with you and had such a wonderful trip. I need your mailing address for our holiday card. I will bring you up to date after the holidays. We had such a great time with you! We had a really good time on your tour and I will put a comment on your website when I get a chance. Since we got delayed for 3 extra days by the volcano, we ended up drinking 2 bottles of your wine, so the only one we ended up taking home was the Amarone which we are saving for our Anniversary on August 3. Mantova was nice, but it would have been better if we were part of a tour as we really didn't know where to go. There was a huge Market going on in Mantova sa it was to hard to get around for all the people and vendors. 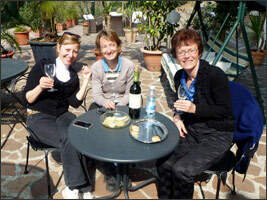 We really liked your Ripasso wine and Gloria is trying to find out how to get some here. Hope you tour business does well. So, if one day, you think seriously to invite cooks of anothers country, think of me! It would be a good reason to come back in Italy! I always keep door open for good ideas! 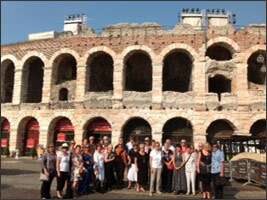 So, again, thank you very much for these two marvelous days in Valpolicella, Garda Lake and Verona! It was a real pleasure! Our drivers were good and I enjoyed seeing the back country with (guide) Laura�s short cuts. All our (cooking) teachers were very knowledgeable and enthusiastic. I could tell they enjoyed their craft. Considering we had only one week to cover so much territory, it was wonderful. Seeing Lago di Garda when it was angry with big waves and white caps was quite the sight. 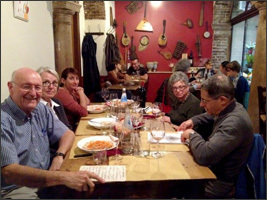 Meeting (guide) Laura�s family was most enjoyable as well as seeing her lovely home, enjoying (her family�s) wines and chocolate cake. Laura was a wonderful guide and so positive and cheerful. The bread making (class) was very informative and a great experience. The rice cooking (class) and overall experience was unique and very interesting. I can�t think of anything to remove or add to this wonderful program. 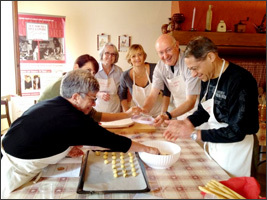 Of all your Italy cooking school tours, this one was the best for content! I really felt and enjoyed the vibe of the area and the people. The atmosphere was relaxed and pleasant. Our activities were well chosen and well paced. No �long, hard days�. Free of tourists and crowds. 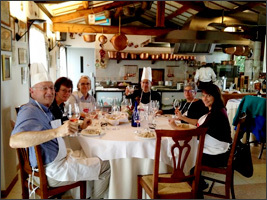 Our local Italian cooking school tour guide Laura was knowledgeable and so personable. Really demonstrated the different wines and micro-regions. 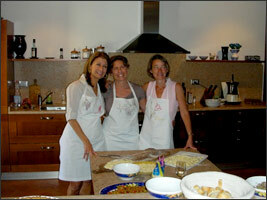 Each chef and cooking lesson was delightfully different. I�m a serious cook but I learned a lot.